A Quick Users Guide to the Flying Squirrel #3 High Altitude Balloon Project. The mission of the Flying Squirrels is to promote STEM (Science Technology, Engineering & Math) skills in a fun project environment. All persons interested in Flying Squirrels are welcome to participate in the project. Our third balloon, Flying Squirrel #3 is ready to launch from the Mojave Desert in S. California. The FS3 payload sends telemetry data back to the ground using the FSQ protocol and WSPR using the 20-meter band. The transmitter on FS3 radiates 20mw. Despite this low level (QRP) power, at high altitude, this signal will radiate far and wide. The similar FS2 mission, was heard across the country on WSPR. 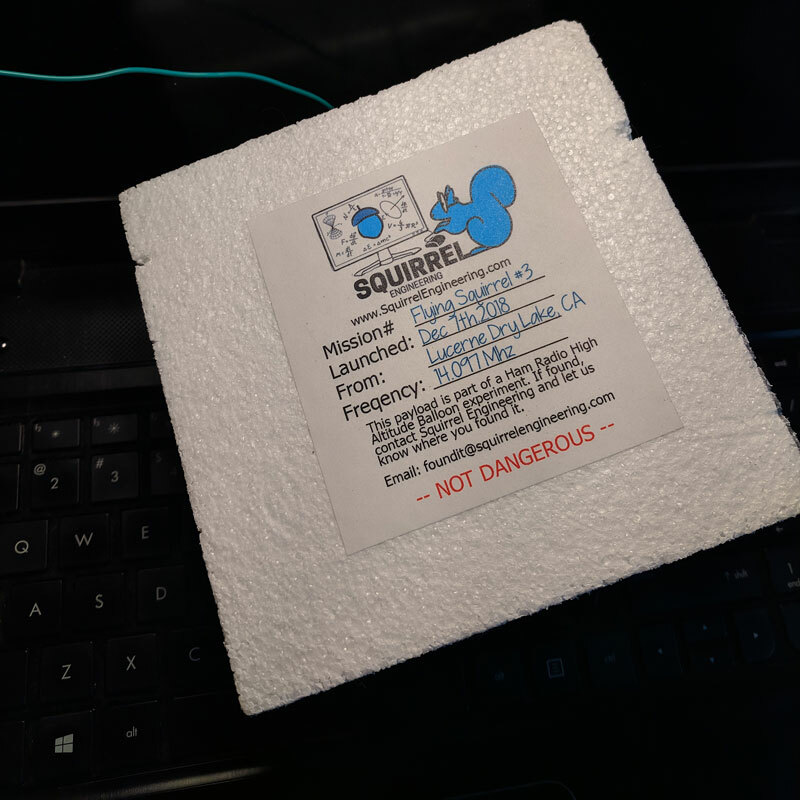 The 20-meter FSQ telemetry will be relayed to the APRS network from our chase vehicle and ground stations (Aka ground Squirrels), so you can track the balloon on APRS. Flying Squirrel #3 is expected to launch around 10AM PST time on Dec 7th, 2018 from the general area of Lucerne Valley, CA. After the passing storms, this week, the desert floor may be wet and muddy in areas, so we will likely have to hunt for a dry sport to launch. For this reason, I can’t say with precision where we will launch from. However, we will be near/on the dry lake bed or over in the Johnson Valley OHV area to the East, probably off Camp Rock Road somewhere. Or somewhere in between. We will be monitoring 146.580 simplex. Give KJ6FO a call if you are looking for us. Announcements are made from this web page and our Squirrel Engineering Facebook page. How to follow the FS3 Balloon. APRS HF FSQ raw telemetry. If you live in the Greater LA Basin area this guide may help . Post flight information will follow. Stay tuned.